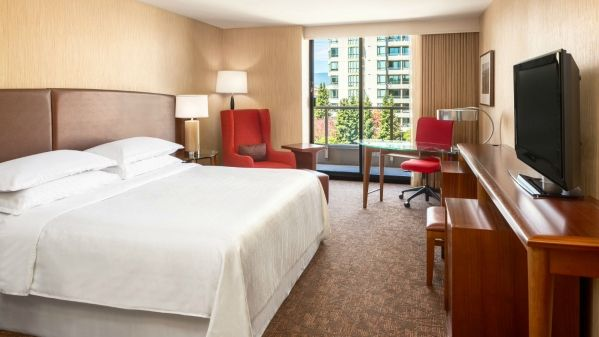 Sheraton Vancouver Airport Hotel is centrally located in Richmond, near top businesses and attractions, approximately 7 km (5 minutes away) from the Vancouver International Airport with complimentary airport shuttle. Guests of the SnowBall Classic will be offered a special room rate of $179 CAD per night. Reserve your rooms now by booking online or calling the hotel directly at (604) 273-7878 or Toll-Free 1-800-663-0299. To ensure you receive the special rate; you must identify yourself as a guest attending the “Snowball Classic, or 2018 Snowball, or DanceSport BC ”. Please be aware that reservations must be made no later than 27-Sept-2018. After this date, reservations can be made on an availability basis and at the best available rate. In the event of cancellation, you must call the hotel no later than 48 hours prior to the day of arrival, otherwise, a cancellation fee of one nights’ room and tax will be charged. The Hotel provides regular shuttle service from to the main terminal at Vancouver International Airport starting at 5:00am with the last shuttle leaving the hotel at midnight. International and Domestic pick-up areas on the arrivals level of the airport are marked as hotel shuttle pick up areas.